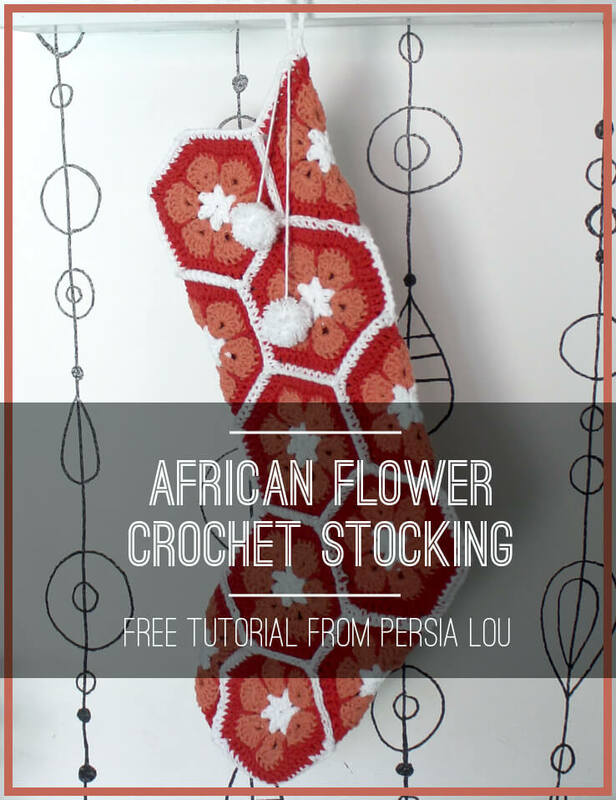 I have wanted to make a project using African Flower hexagons for a while, and I finally got to it with this stocking. I am really happy with the way it turned out. Hope you like it too! I’m calling this post a tutorial rather than a pattern because it is not a comprehensive written pattern, but it should give you everything you need to make your own. 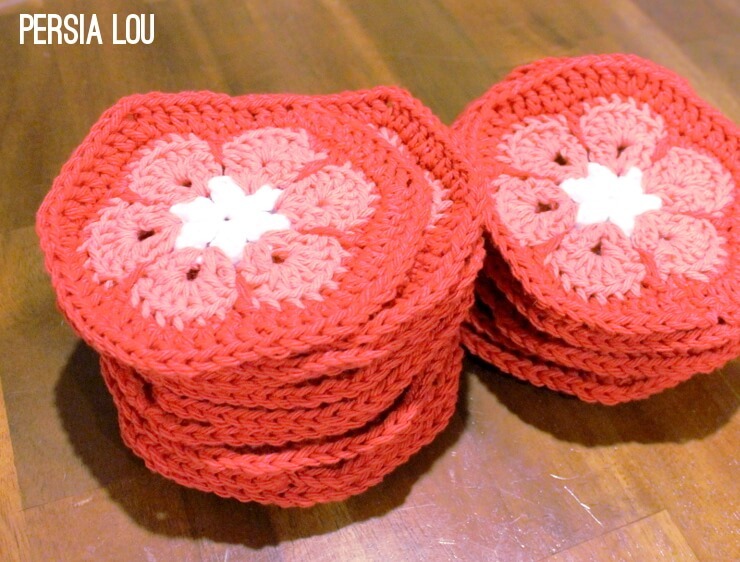 First off, you will need to make 17 African Flower Hexagons. 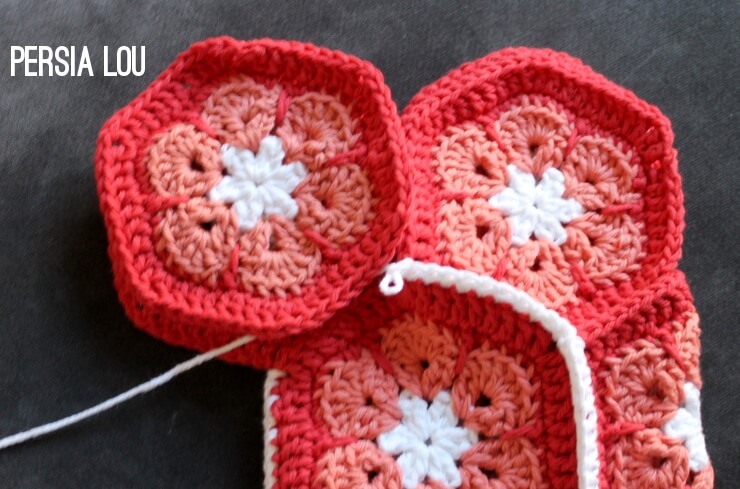 Heidi Bears has a great photo tutorial for the African Flower Hexagons that you should definitely check out. My version is just slightly different. Rnd 1: Start with magic loop, in loop, ch 3, dc, ch 1, *2 dc, ch 1, repeat from * 4 times, sl st to join (12 dc, 6 ch 1 spaces). Finish off. Rnd 2: Change color. Join yarn in ch 1 space. Ch 3, dc, ch 1, 2dc in same ch 1 space; *2 dc ch 1 2dc in next ch 1 space, repeat from * 4 times, sl st to join (24 dc, 6 ch 1 spaces). Rnd 3: Sl st to next ch 1 space. ch3, 6 dc in same ch 1 space, *7 dc in next ch 1 space, repeat from * 4 times, sl st to join (42 dcs). Finish off. Rnd 4: Change color. Join yarn in first stitch of last round. Working in back loops only, ch 1, sc, sc in back loops of next 6 stitches, dc in space between the 2 dc clusters in round 3 below (this will create a long dc that forms the petals of the flower. See Heidi Bear’s tutorial for a great visual), *sc in back loops of next 7 stitches, dc in space between 2 dc clusters in rnd 3 below, repeat from * 4 times, sl st to join (42 sc, 6 dc). Rnd 5: Ch3, dc in next 2 sts; dc, ch 1, dc in next st to form corner; *dc in next 7 sts; dc, ch 1, dc in next st to form corner; repeat from * 4 times, sl st to join (48 dc). Finish off. Weave in ends. Pretty soon you will have a pretty little stack of hexagons. 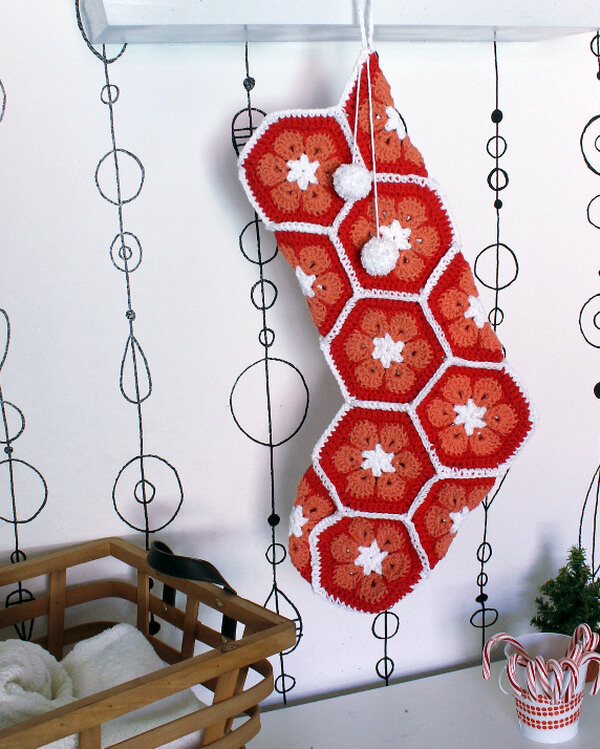 You need 17 hexagons to build your stocking. The stocking is made up of five rows (really more like tubes I suppose) of hexagons. You can see how many hexagons are in each row below. I used white yarn and my H hook to crochet the hexagons together. 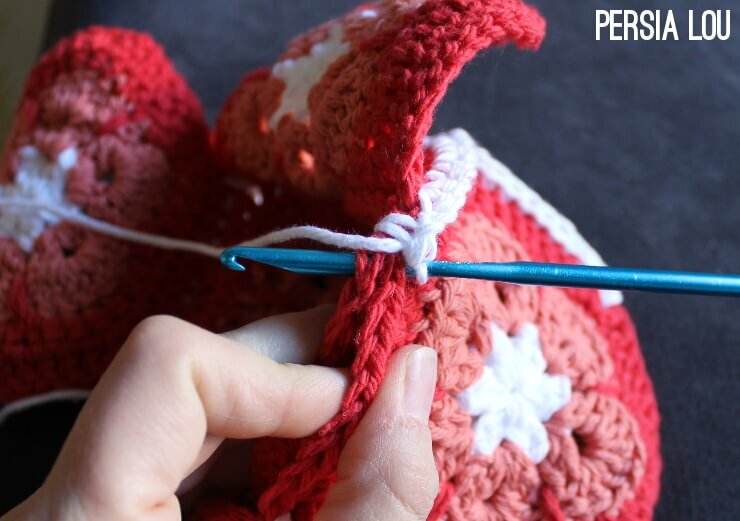 Hold the two hexagons wrong side together and work your stitch through the top loops of each stitch as shown in the photo below. A few guidelines for piecing your hexagons together: Work one single crochet into each stitch and a sc, ch 1, sc into each corner space. I tried to keep going with one piece of yarn as much as possible, but you will have to cut and add in new yarn many times. When joining into a corner slip stich into the chain 1 space as shown below. I started piecing my stocking together at the top by joining three hexagons into a tube. Then I added hexagons to form the next row. 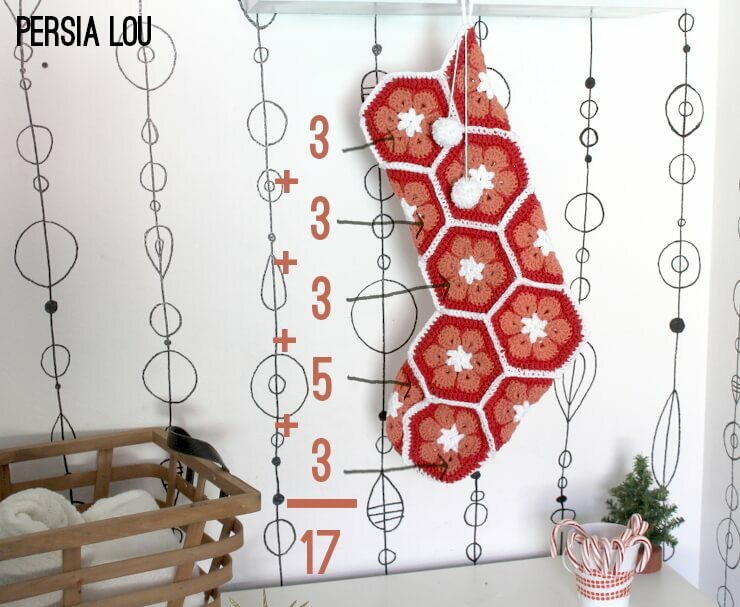 When you get to the fourth row, you will form the foot part of the stocking with two more hexagons than the previous rows. 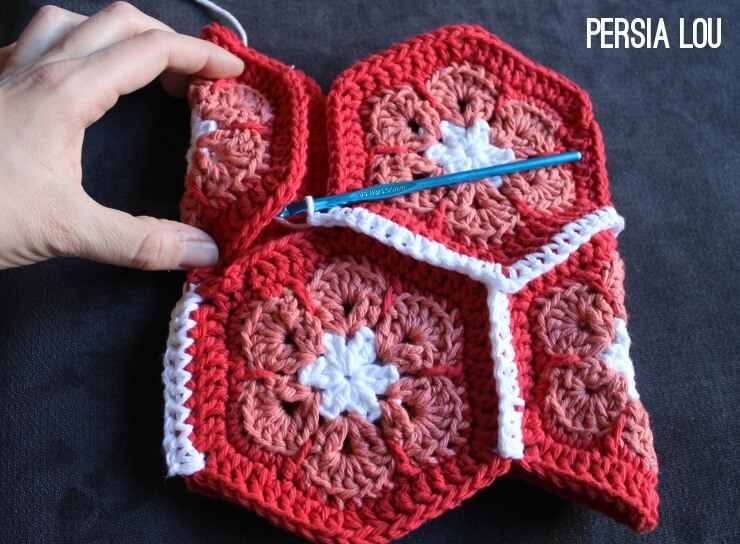 To form the toe of the stocking, you will stitch three hexagons together as shown in the picture below. I finished the stocking off by joining my white yarn to the back (where the heel of the stocking is) of the top row. I formed a ch 12 loop to hang the stocking, then single crocheted in each stitch all the way around (work a sc, ch 1, sc in the corner spaces). Then I made a pair of little fluffly pom-poms to tie on. (Learn how to make pom-poms with just your fingers here). Oh my goodness, so pretty! I love the colors you used. I wish I could crochet! Gorgeeeoouuussss. Prettiest stocking I&#39;ve seen. The pom poms! And I love that stocking holder!! And what is that wall paper!!! Everything is cute. I LOVE these! 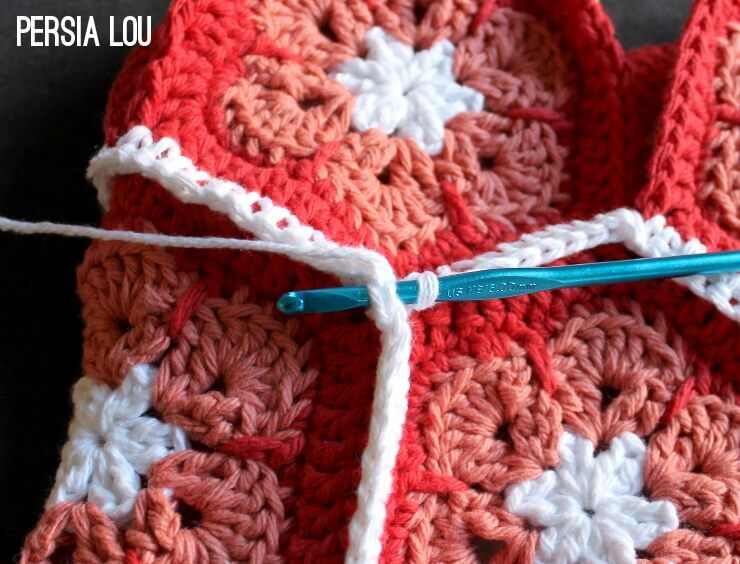 I love the African Flower pattern, but i hate afghans (shh, don&#39;t tell any other crocheters!). I love that you made a stocking with them! SO cute! That&#39;s gorgeous! It&#39;s completely intimidating, but still…Wow! I&#39;ve wanted to try the African flower pattern for ages, but they never seem to make it to the top of the list. Now I guess they should! This is so pretty! 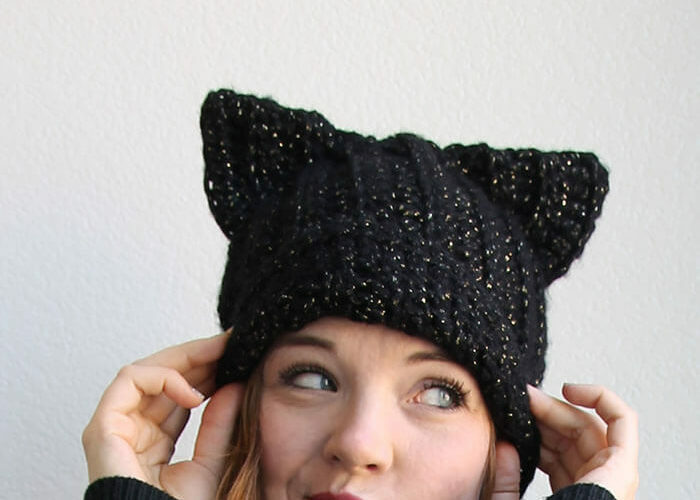 Makes me wish I knew how to follow a crochet pattern. Oh, I LOVE this! 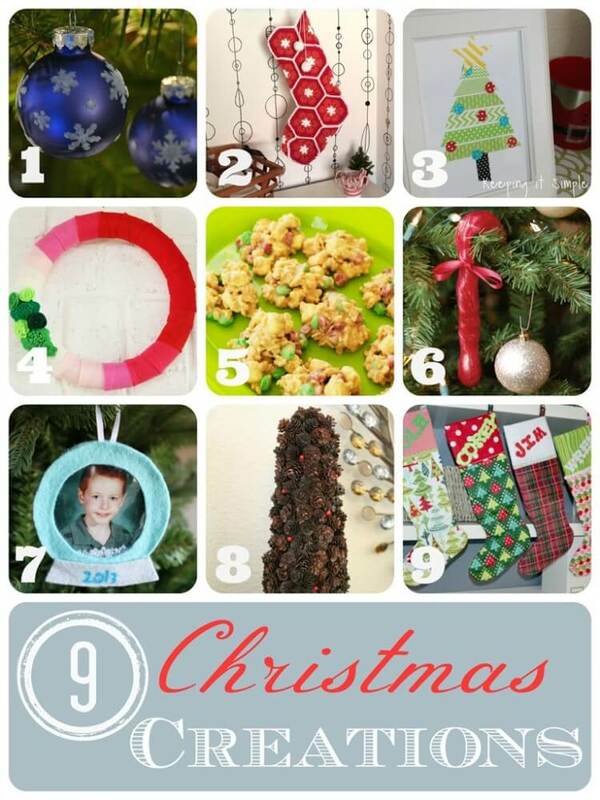 Definitely want to make one for my own (though I have to be fast, if I want it to be finished before X-mas, haha). I came here from the &quot;Link it or Lump it&quot; party. This is a really fresh take on both stockings and crocheted Christmas decorations! I love love love it! Thanks for sharing! Copying this next year. 100% so cute! Do you think a smaller version with less hexagons woulo be possible? I&#39;m working on one for my daughter for Christmas but I crochet slowly and only have 7 done. I&#39;m worried I won&#39;t finish in time.